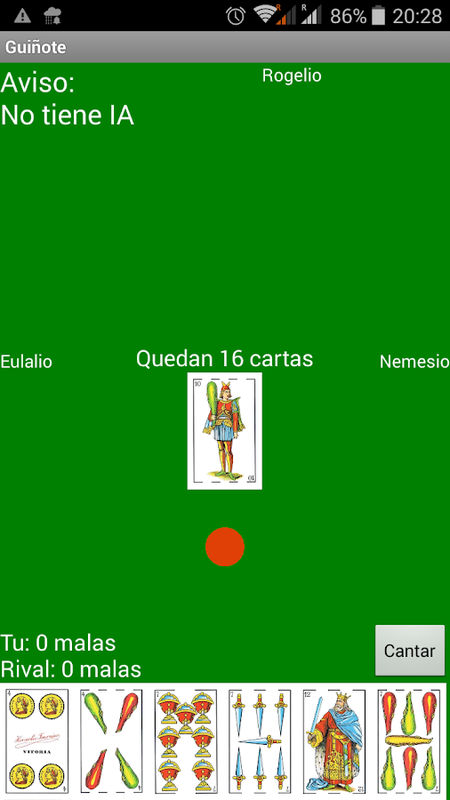 Juega al guiñote gratis sin necesidad de baraja, solo necesitas unsmartphone o tablet android.Puedes jugar contra la máquina o através de internet contra jugadores de todo el mundo.Play freeguiñote without deck, you just need a smartphone or tabletandroid.You can play against the computer or online against playersfrom around the world. Truco is a variant of Truc and a popular trick-taking card gameoriginally from Valencia and Balearic Islands (Spain) and played inBrazil, Argentina, Paraguay, Italy (in Piemonte, in Lomellina, anda particular variant in the towns Porto San Giorgio, Sirolo,Numana, Porto Recanati, Potenza Picena (Marche) and Paulilatino(Sardegna) ), Uruguay, southern Chile and Venezuela. It is playedusing a Spanish deck, by two, four or six players.... ach player isdealt three cards from a subset of the deck consisting of thenumbers 1 to 7 and figures sota in Spanish or valete in Portuguese(jack, worth 10), caballo in Spanish or dama in Portuguese(equivalent to a queen, worth 11) and rey in Spanish or rei inPortuguese (king, worth 12). The game is played until a teamfinishes a game with 15/30 points or more. The 30 points arecommonly split into two halves, the lower half called malas inSpanish or ruins in Portuguese (bad) and the higher half calledbuenas in Spanish or boas in Portuguese (good). Therefore a teamwith 8 points would be ocho malas or oito ruins (8 bad ones), and ateam with 21 points would be seis buenas or seis boas (6 goodones). However, because both teams can score points in one round,it is possible (but very rare) for both teams to go over 30 pointsin one round. Usually as soon as one team goes over 30 points, thegame is ended, to stop there being a tie situation. However,sometimes the winner is the one with more points, otherwise anotherhand is played, until the tie is broken. The popular appeal of thegame comes from the exciting bidding process. Each type of scoringcan be bid on to score your team more points. Bids can be accepted,rejected or upped. Bluffing and deception are also fundamental tothe game. Structure of the game: Players can earn points in threedifferent ways. These will be further developed below in specialsections for each one. Truco: points can be earned by winning inthe playing of the cards (the "tricks"). Envido: points can beearned by having the best combination of two cards of the same suitor a single card. Flor: points may be earned by having all threecards of the same suit. The score won by a player is added to histeam's score (when playing in teams). Any bet, win, loss, orsurrender by a player also affects his partner/s. For this reason,partnerships are usually formed by mutual arrangement between twoplayers who know each other very well. As in bridge, it is not rarefor partners to share information using preestablished signs andgestures. Communication is usually performed by a standard set ofgestures (see señas). Arranging a secret set of gestures is thusfrowned upon. Entertaining game of Spanish cards. The Cuatrola is a card game inwhich two pairs of players compete. The arrangement of the playerson the table or game board is crossed, such that the components ofa single partner are face to face. Typical game of Spanish cards ofthe Tute and Brisca family, played mostly in Extremadura You willsee your ride the subway, bus, train flies while playing. Thisgame, Family and Brisca Tute, with roots in Extremadura, Murcia andparts of Castilla, although you can find people who can play inmany parts of Spain, is a very entertaining game that will takehours. VERY SOON ONLINE.